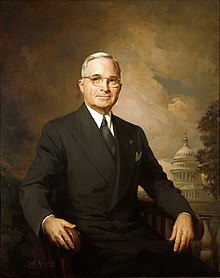 Harry S. Truman (May 8, 1884 - December 26, 1972) wis the 33nt Preses o the Unitit States frae 1945 (daith o Franklin Delano Roosevelt) tae 1953. Wikimedia Commons haes media relatit tae Harry S. Truman. This page wis last eeditit on 11 Februar 2017, at 05:15.